A few of our readers have commented that they are intimidated by their oven, and sometimes don’t know how to use it. This is a perfect dish to start practicing your skills, it is almost foolproof. Originally I had no intention of sharing this in our blog, but when I saw how just nice it looked I decided to make a picture of it, at least to remember the dish later. I ran to get my camera while my child and husband looked at me with hungry eyes, something that happens quite frequently in this home. You’d think that by now Nadia and Bo would be used to it; they aren’t. Later on I found the recipe in my notebook and decided to share it with you. If you bake the potatoes at the same time the pork is in the oven, you can take a good long break from the kitchen and just come back to serve. Perfect for a summer weekend. I love that! Rosemary and Olives Pork Roast Recipe: This spectacular-looking dish is very simple and requires little in the way of work or skills. A perfect dish for a weekend meal. Heat the oven to 350 ºF [150 ºC]. In the food processor pulse the olives, peppercorns, olive oil and salt. Stuff the meat with half the olive paste, and 4 cloves of garlic each. 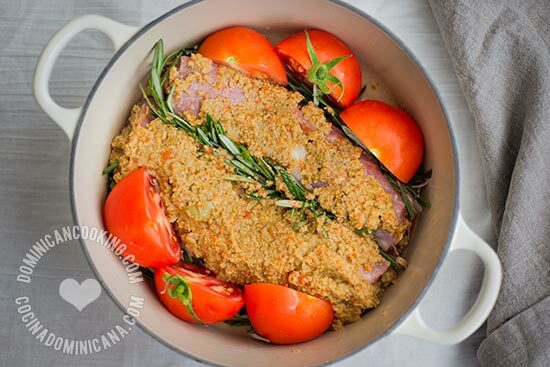 Place the fillets in a casserole, place the sprig of rosemary between them and top with the remaining olive paste. Halve the tomatoes and place in the casserole. Cover the casserole and cook in the oven for 50 minutes. Serve with oven-"fried" potato wedges. Can you use chicken or fish instead?? Tried this recipe and it was delicious… My 8 yr old daughter, who is very picky and said she wasn’t having any when I was preparing the meat, kept asking for more! Thanks for this wonderful website! Why can't I print the pictures?